This week has been bananas! Other people's spring break equals my nightmare (I work in retail). Luckily, I have today off where I can finally take a breather. I did not sleep in though, I woke up, got ready, and went out to take these photos. I always try to make an afford to blog as often as I can and since I haven't had a chance to document any of my outfits the past few days I figured I better do it this morning or else! Say hello to my beautiful Zodiac Rising dress by Evil Twin. I really love the contrast between the feminine babydoll silhouette and the bold edgy print. For such a loud design, I kept the rest of the outfit rather simple and it is only appropriate that I matched the zodiac print with celestial hologram booties. I call them my moon shoes. 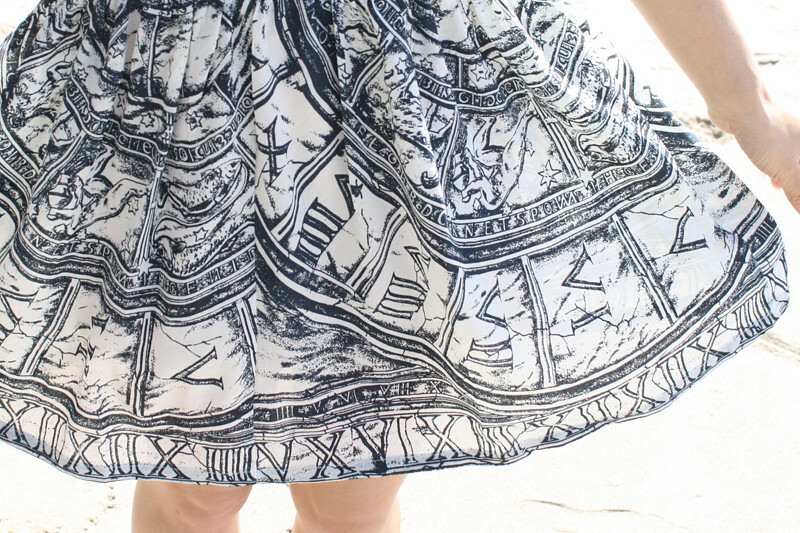 Zodiac Rising dress by Evil Twin from ASOS. 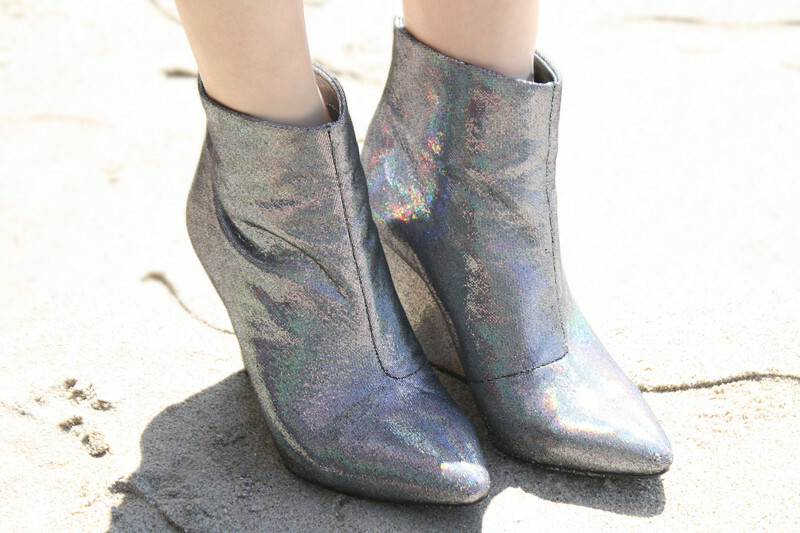 Hologram wedged booties from H&M. 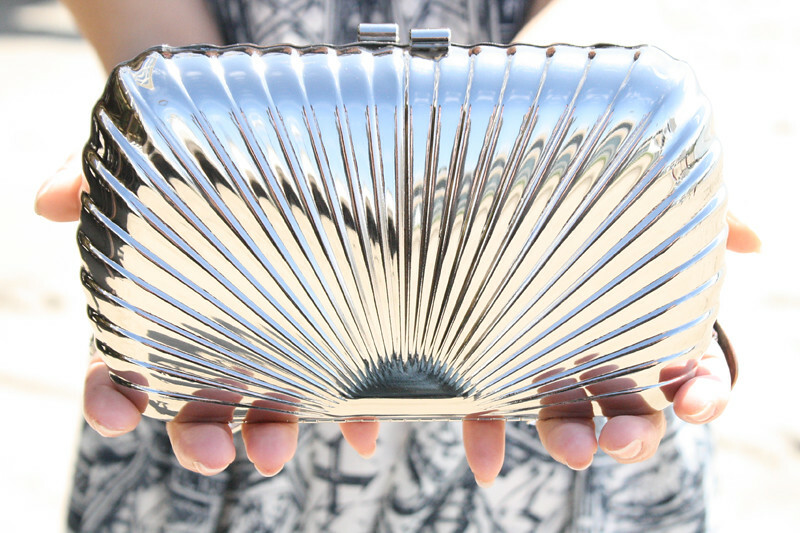 Silver hard clutch from my work Sway. My crazy cat lady status has officially gone up another level with this awesome cat beanie from Chicnova. This outfit is a bit darker than my normal get up with a black color scheme and dark lipstick. I like to experience with various looks and luckily many say I can indeed pull off totally different styles. Hey, dream big, style big! 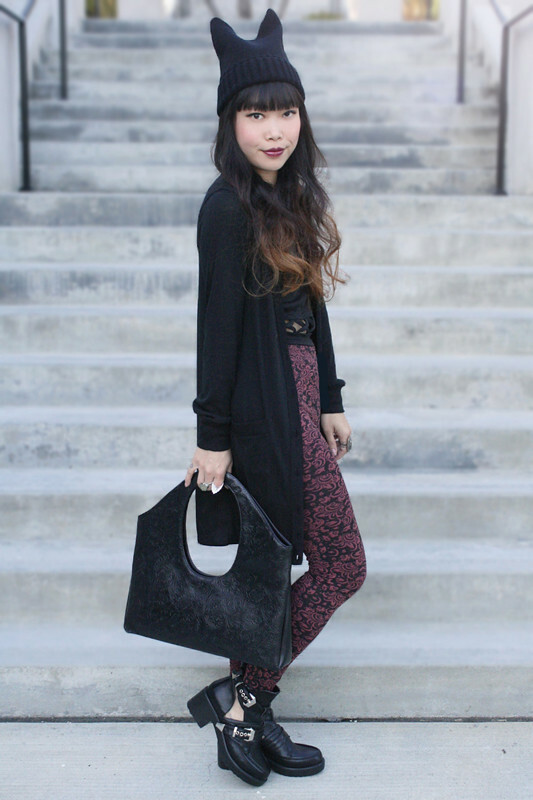 Wearing mostly black in criss cross cut out crop top, long cardigan sweater, ornate leggings, and Coltrane lookalikes. Notice how I am matching my leggings with my Avant Garde handbag in which both have similar ornate pattern? I told you I like to play with little details! Criss cross cut out crop tank from Charlotte Russe. Long cardigan sweater by Delirious from Ross. 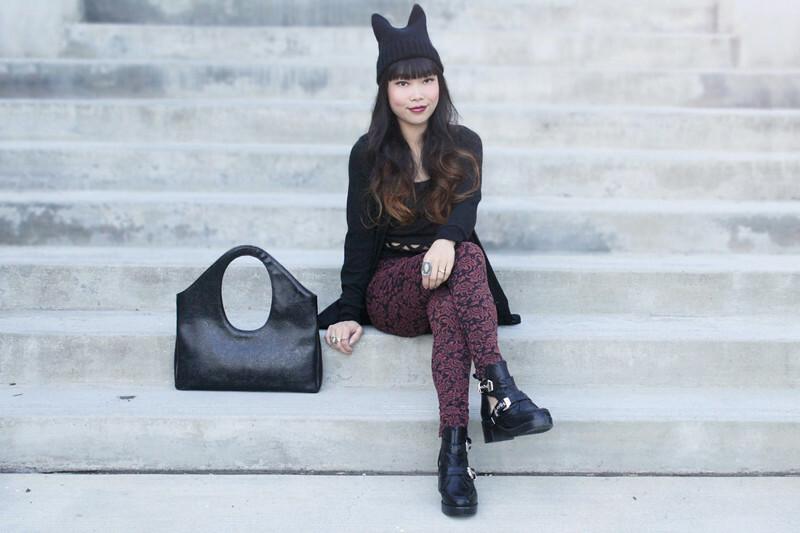 Ornate leggings by ShoSho from Ross. 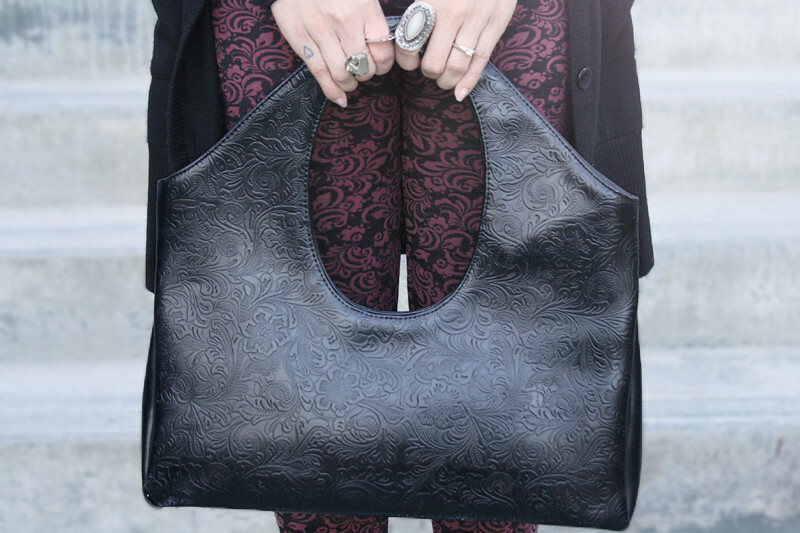 Vintage Avant Garde embossed ornate handbag from Buffalo Exchange. Rebel scholar booties from Tobi. People tend to wonder why I am always so well put together. The answer is... I am a perfectionist, therefore, every little detail matters. Even the most unmatching outfit, or so it seems, would be well thought out. I am not one to be spontaneous, except on lazy days or sick days or if I am just going to the grocery. Because of that, I love things with great details such as this incredible "The Never Ending Story" necklace by Holst + Lee. This handmade necklace is one of the most interesting pieces of jewelry I have ever seen! The mix of fabric and texture, the fancy knot like design, and the beautiful gold hardware are all out of this world! A piece like that is a statement of its own, so I paired it with a simple yet darling marigold dress gifted by Calico. I adore the color, the ribbed texture, and the cute buttoned details on the sides. I layered a sequined collar chiffon top for fun and accessorized with matching satchel and boots. I was lusting for these boots from TopShop for months but I couldn't resist any longer. I am so glad I bought them because they are super amazing! The Never Ending Story necklace by Holst + Lee c/o The Collective. Marigold Bonnie skater dress by Ya c/o Calico. Sequined collar chiffon top by Cotton Candy from my work Sway. 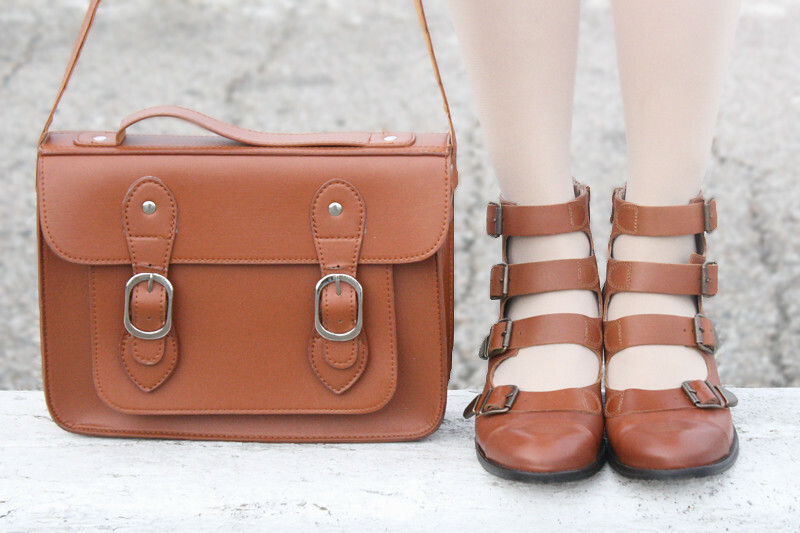 Brown leather satchel from Hong Kong. 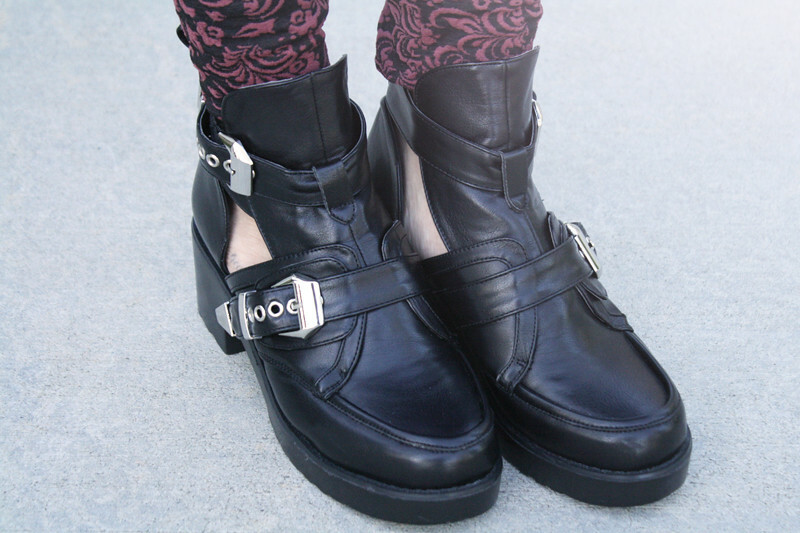 Anna buckle strap leather boots from TopShop. Today is the last day of winter! I am looking forward for the weather to start getting warmer because I already have tons of new spring pieces waiting to be worn! I am so thankful for seasons though, I would hate to live in a tropical place all year around or vice versa a cold place all year around and be limited to what I can wear. Anyways, after dinner in Capitola the other day, I snapped some photos in the quirky little historic Lawn Way. Wearing a monochromatic attire in a vintage stripes sweater gifted to me by the lovely vintage etsy shop jeffANDlow, American Apparel riding pants in safari, and my gorgeous Jeffrey Campbell Clift in tapestry. Not sure if you can tell, but the tapestry is really velvety and fuzzy, hence adds dimension to the shoes. And yes, I can't stop wearing these sunglasses from ZeroUV. I am a little obsessed. 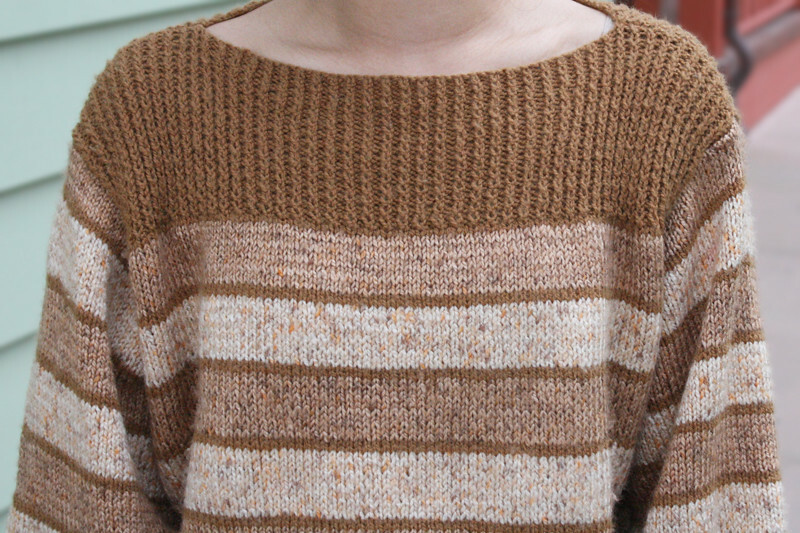 Vintage stripes boat neck sweater c/o jeffANDlow. High waisted riding pants in safari from American Apparel. 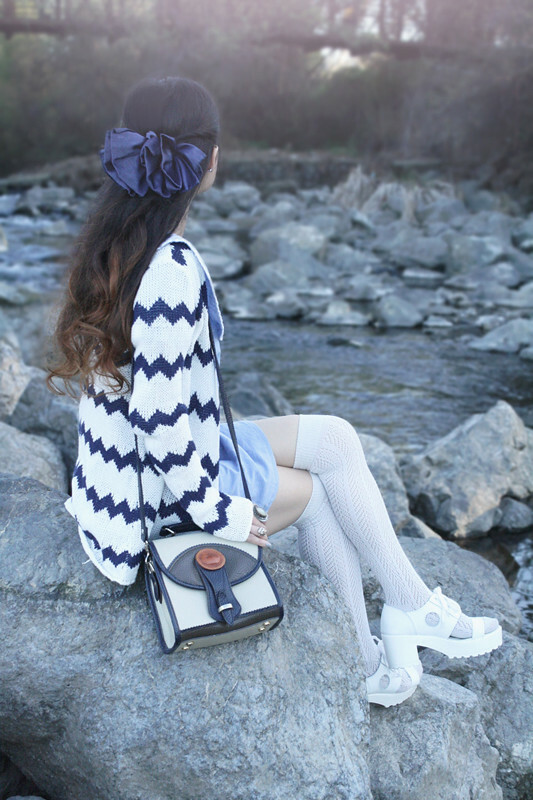 Clift booties in tapestry by Jeffrey Campbell from Ma Petite Shoe. 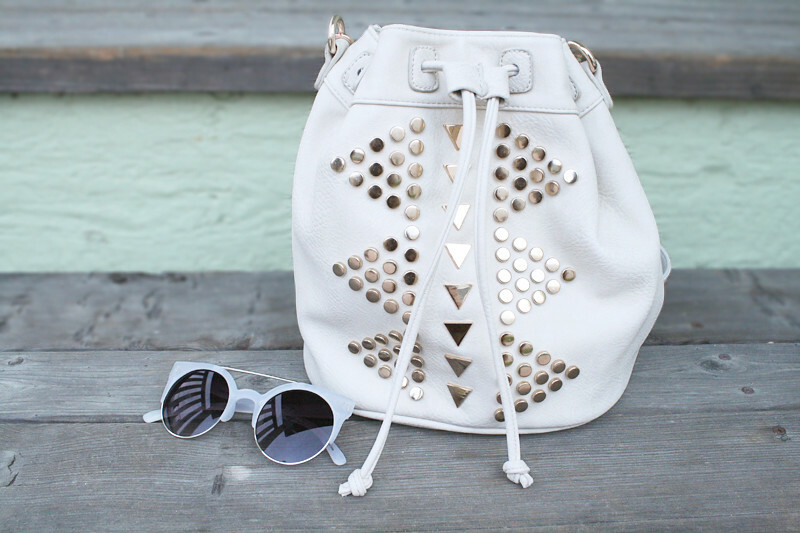 Studded bucket bag by Street Level from my work Sway. Happy St. Patrick's Day everyone! One of the greatest things about having a fashion blog is that I get to dress up and post outfits that are specifically for different occasions. I am not too big of a fan when it comes to green but every year St. Patrick's Day gives me a chance to try something new. 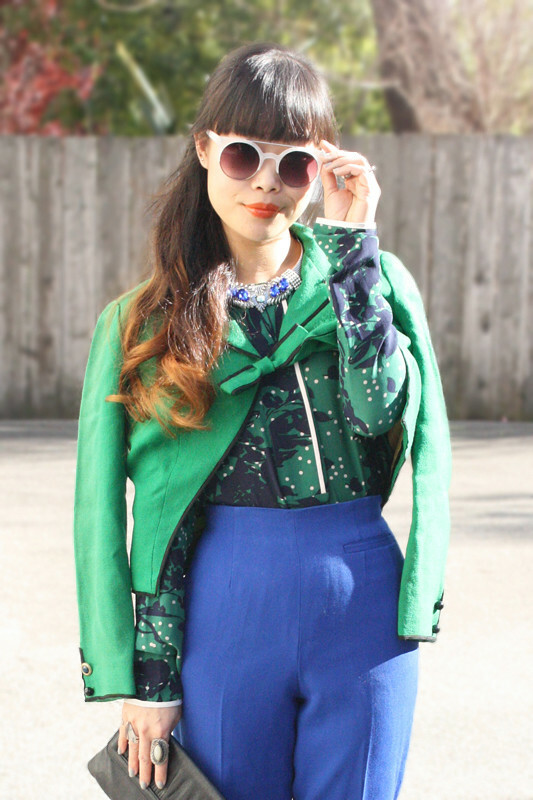 This year, I have decided to pair a lovely floral silk blouse by Aryn K layered with a vintage blazer and vintage high waisted trousers, accessorized with Lulu Frost Demeter Collar necklace, my new favorite sunnies from ZeroUV, and orange lips wearing Lime Crime's My Beautiful Rocket. Instead of heels, I just slipped on some flats to keep things simple since the whole look is already a little over-the-top tailored and glam. 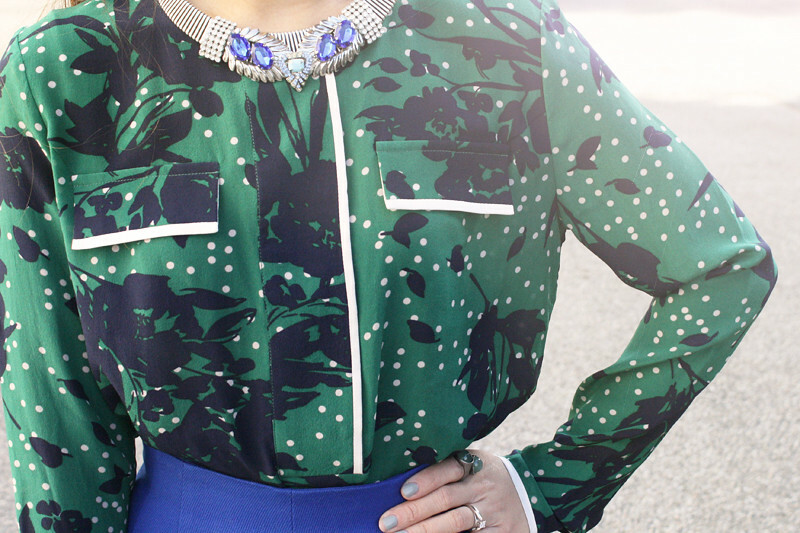 Floral silk blouse c/o Aryn K.
Vintage blazer with bow closure from Etsy. Thrifted vintage high waisted wool trousers by Liz Claiborne. 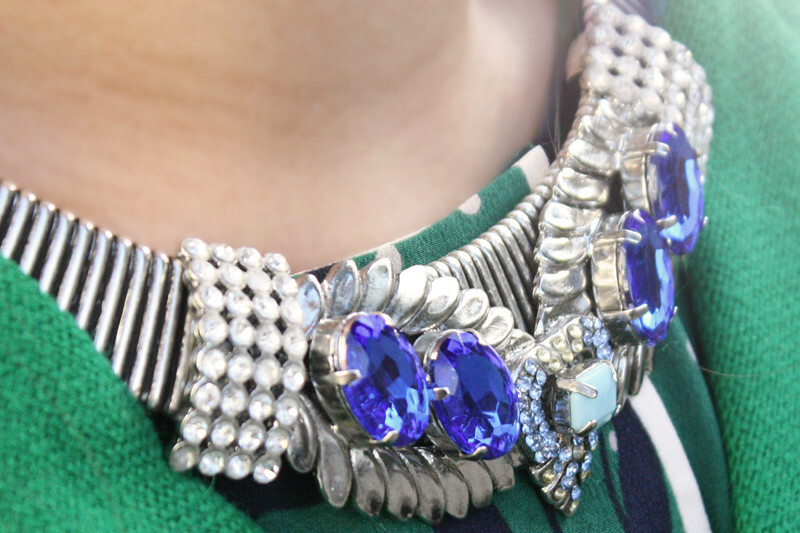 Demeter Collar necklace by Lulu Frost c/o The Collective. 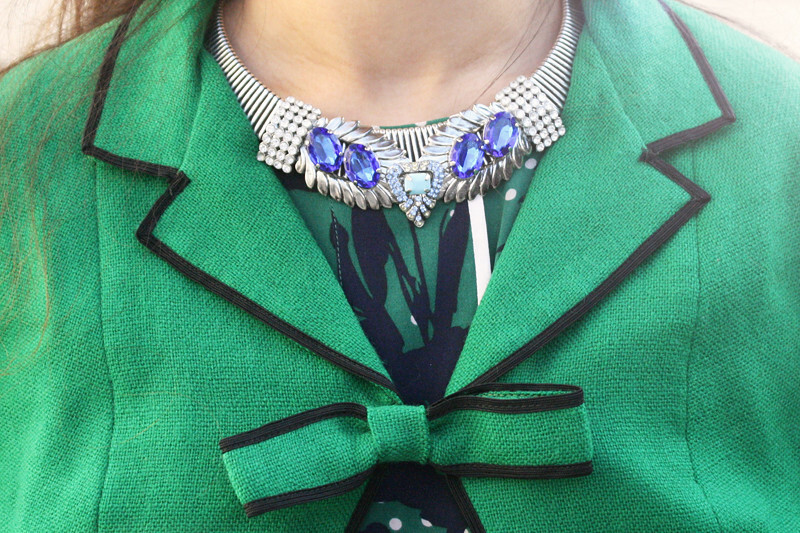 I love this playful spring time look made up of a perfect blend of vintage and modern pieces. 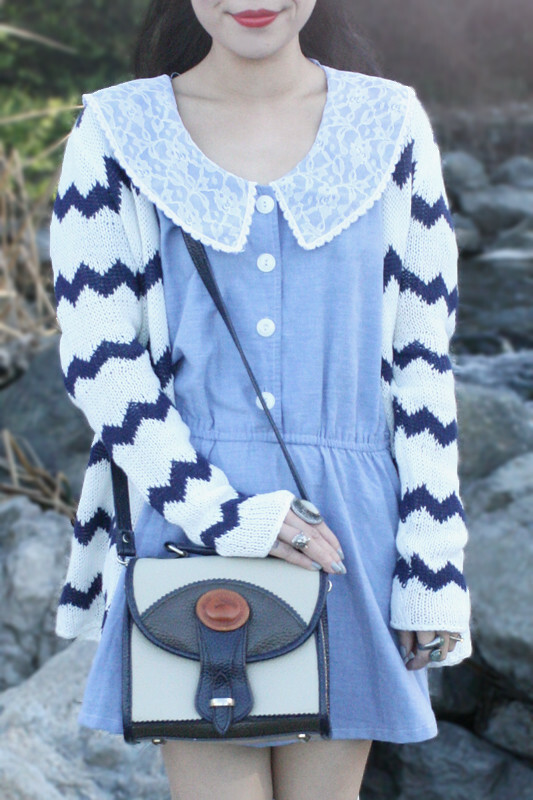 The Zelda sweater by BB Dakota with contemporary zig zag print layered over a sweet vintage chambray dress with lace collar. I accessorized the outfit with a vintage Dooney & Bourke bag, vintage giant satin hair bow, pointelle knit socks, and these cutting-edge chunky platformed sandals that are totally trending right now. And the best part is... I kind of look like a child! Zelda zig zag sweater c/o BB Dakota. 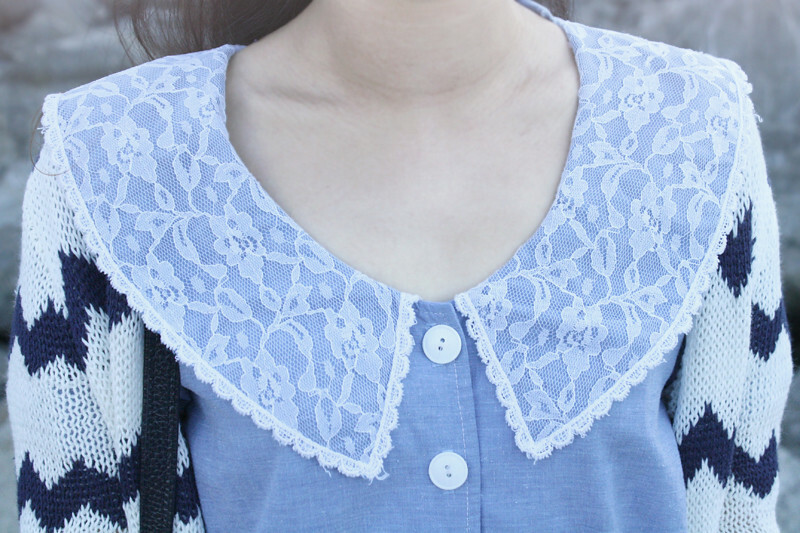 Vintage lace collar chambray dress by Periwinkle from Etsy. Pointelle knit socks from F21. 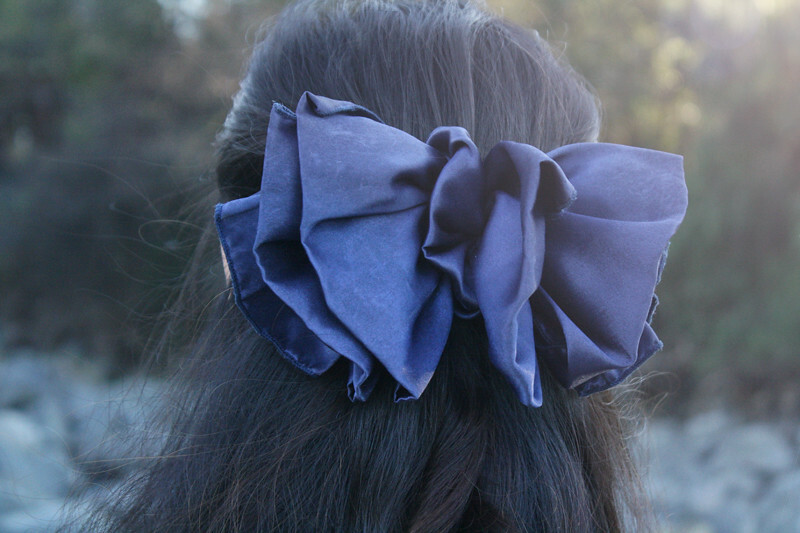 Thrifted vintage satin hair bow. Chunky platformed lace up sandals from Hong Kong.